Powder pollution only aim in the environment, it results in coking. Spot and others problem happened. AS series is focus on separate the powder and granulate, it risen up the quality, reduce defective and a peak of saving resource. It is special for transparent material and white material identify the consequence. Pulian provides variously granulators and shredders equipment over 100 models to satisfy customer. 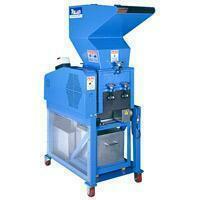 Granulators and shredders can be used multiple ways and be adopted with every producing line. Such as injection molding machine, blow molding machine, extrusion molding machine, recycling line. Also be using to grind IC, stick, lumber, board, wire line, tire, film waste, food waste, EPS, PET bottles, PP/PE film, PVC/PP/PE pipe, and so on. Pulian's granulators & shredders equipments are best products that you are looking for, and must can satisfy your expect. As plastic recycling becomes an issue that the entire industry cares about, Pulian performs really well as a recycling equipments supplier. In our line of recycling equipments supplier, there are crusher machine, Shredder Machine, Plastic Granulator and etc. As a professional crusher machine> supplier, Pulian offers complete plastic recycling machinery series, including: Plastic Granulator, Mixer Machine, and crusher machine. Complementary parts of blow molding machines are also available. With extensive experience in crusher machine recycling machinery, Pulian International offers a series of quality shredder machines including crusher machine which is suitable for processing waste plastics. Our crusher machines are especially efficient for processing rubber sheet, plastic sheet, foam plastic, and other plastic waste. This model of crusher machine is one of the basic crusher machines; this crusher machine’s advantages include quality machine parts, the best cutting angles, easy-to-clean and easy- to-change parts. There are 25 crusher machines classified by loading and purpose for your demand. Crusher machine: Twin Shaft Shredder AG series of Pulian International Enterprise is effective for preliminary processing of huge waste, disposed tires, mattresses, electronic waste, waste paper, disposed leather, and etc.. AG series can process waste into desirable sizes. We also offer crusher machine series that can enhance the preliminarily processing the waste, and cut the processed waste into even smaller particles. Looking for reliable crusher machine? Contact Pulain today for detailed information.